Imagine riding mile after mile of hot, bone-dry desert, the highway unwinding underneath your tires as you roll towards a mirage in the distance. As you get closer, you can just make out the contours of a city skyline glimmering in the sun. As you get closer there it is: an oasis of eternal action in the desert, a dazzling sea of neon lights against the dark backdrop of the Mojave Desert. A city that never sleeps, Las Vegas is simultaneously everything you expect and yet nothing that you might expect. It can feel like a Disneyland for adults with its unique architecture, expert showmanship, and a myriad of casinos where you forget the passage of time. Las Vegas can feel like a sophisticated hub of art, music, and culture. It can also feel like a weird and wonderful paradise full of the most extravagant experiences imaginable. Known for its history of slick mafia crime lords and the most daring casino scams, Las Vegas is a place where anything is possible. Las Vegas can be overwhelming with an endless variety of shows, sights, and activities. With our insider information you can experience the best of Las Vegas and explore all that the city has to offer. 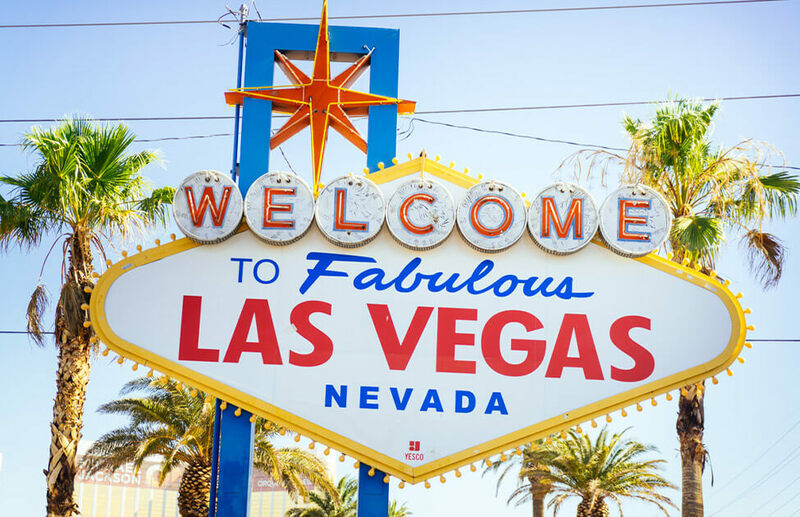 In this article, we’ll cover Las Vegas shows and entertainment, gambling, cuisine, and culture, as well as the many exhilarating rides and trips around town. Here is what you need to know to have an unforgettable Las Vegas experience. If you're new to EagleRider, let's take a look at the rental locations first, so you can get oriented. If you're looking for a specific make or model, be sure to check all four locations for availability. Our team is happy to assist with trip planning and any booking questions you may have - contact page is a fast way to get in touch. 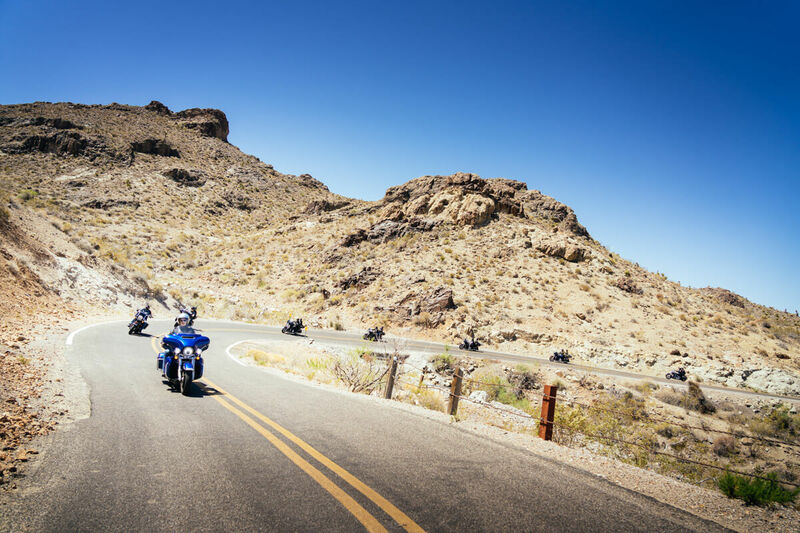 Las Vegas is the perfect start to any motorcycle adventure. 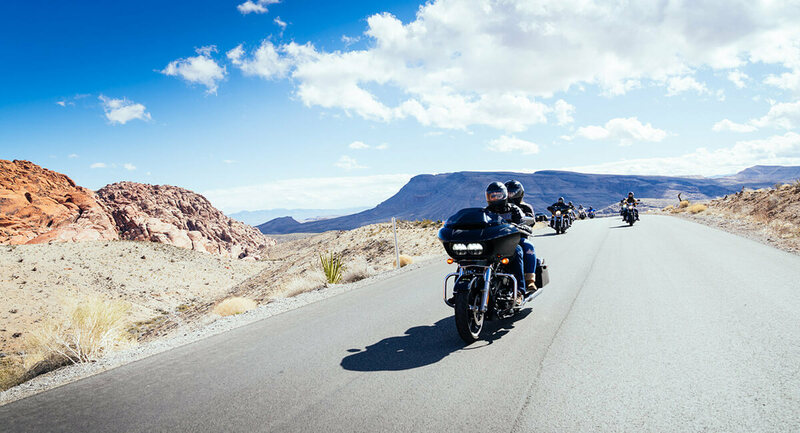 With so many great day rides and weekend rides to do, you can easily start a longer adventure from the Sin City as well. Let's look at some fantastic day rides in the area and explore how each one is unique. Route maps will help you get oriented and you can load them up into your H-D touring models, GPX phone apps, and GPS devices. Let's get started. 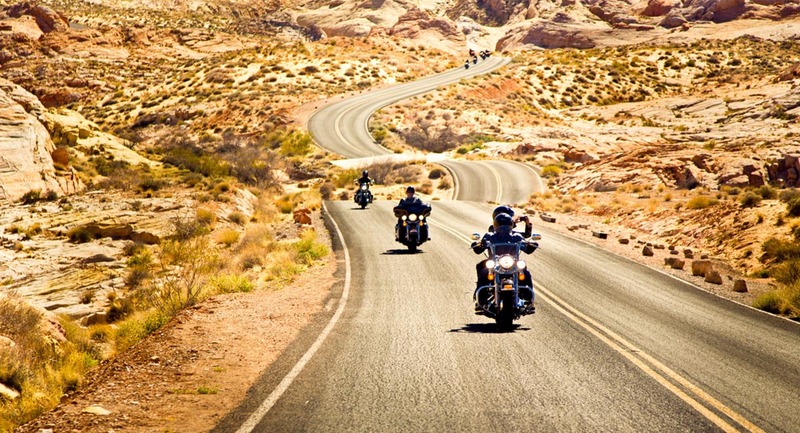 Easily one of the most memorable day rides out of any city in the world, Valley of Fire is one of our top choices for riding in Vegas. Fabulous views will accompany you along the whole stretch of the State Park and it’s best to do a full loop instead of coming in and out from the same entrance. You will be surrounded by stunning natural monuments of geologic pre-history throughout the vast and peaceful 46,000-acre Valley of Fire State Park. The park is located some 50 miles northeast of Las Vegas and accessible via I-15 north to exit 75 and Valley of Fire east. 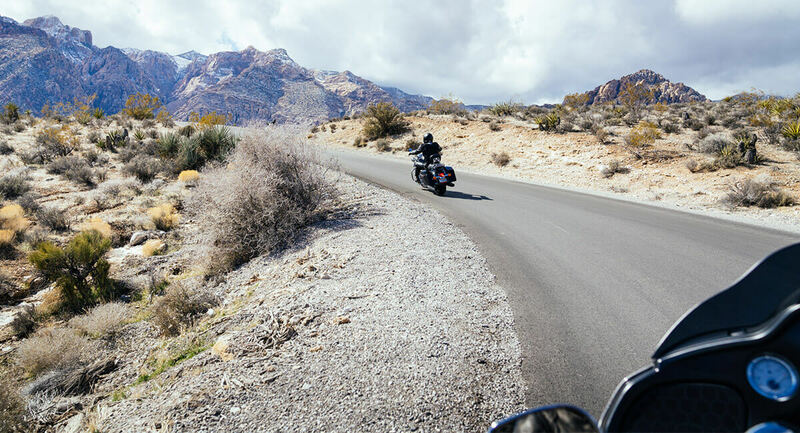 You can ride straight through the park using the Nevada Scenic Byway, a 10.5 mile stretch between the eastern and western entrances. 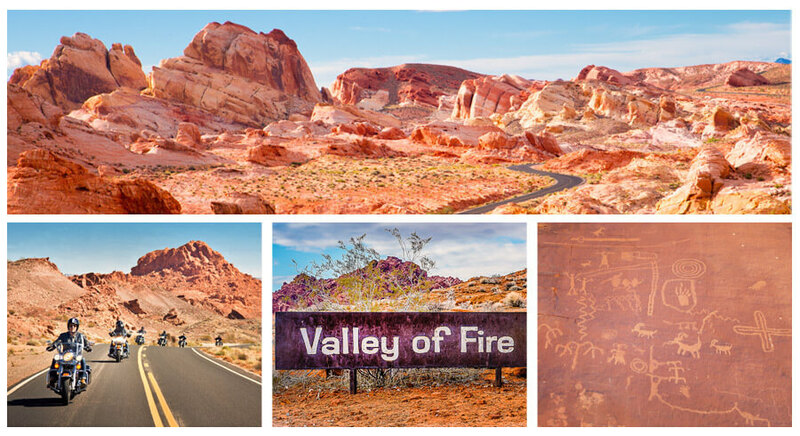 Valley of Fire State Park is known for – and named after - its rusting red sandstone formations and petrified sand dunes which appear as if they are on fire during sunset. Riding through the park feels like being on some distant, deserted planet where wilderness and nature reign. 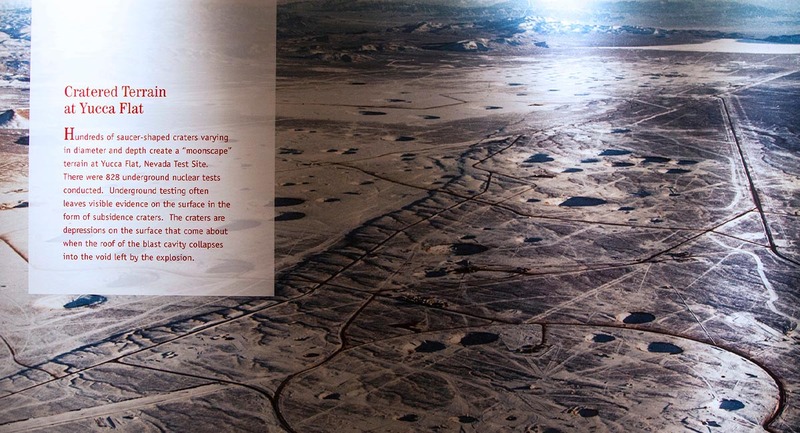 The surreal landscape of the area was created over time. Ancient seas invaded and retreated in the Southwest for hundreds of millions of years, each epoch leaving behind thick deposits of sedimentary rock in the form of sandstone, mudstone, limestone, and conglomerate. Wind and water erosion of the relatively soft and brittle rock created the Martian shapes we see today. The area feels so otherworldly that numerous Hollywood directors have taken advantage of the incredible landscape. 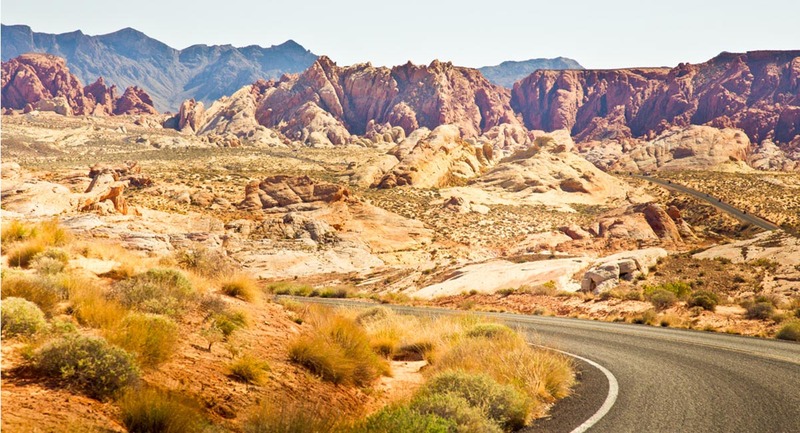 Movies like Star Trek Generations, Total Recall, and Viva Las Vegas among others were filmed right here in the Valley of Fire. The area also contains petrified trees and petroglyphs, evidence of human occupation that goes back at least 2,000 years. The Visitor Center features exhibits on the geology, ecology, prehistory, and history of the park and nearby region. 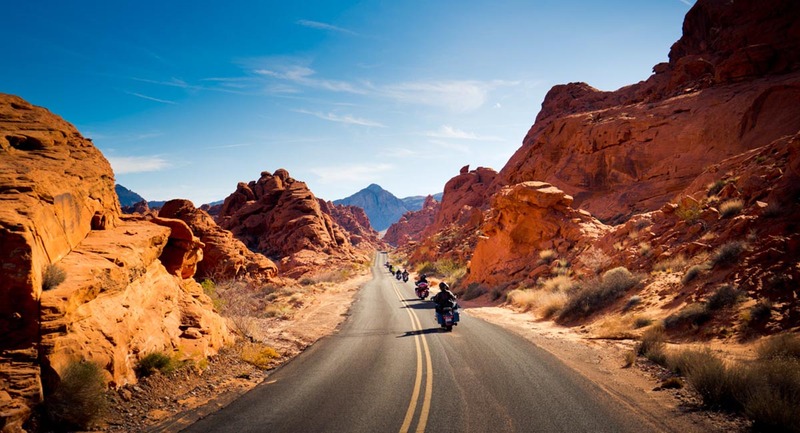 Open year-round, Valley of Fire State Park has 72 campsites equipped with shaded tables, grills, and water, as well as a number of hiking trails if you want to stretch those biker legs. The Visitor Center is open daily from 8:30 am to 4:30 pm The park closes at sunset. An entrance fee of $10 per vehicle is required to ride the Valley of Fire Road between the west and east entrance stations. Nevada residents get a $2 discount. 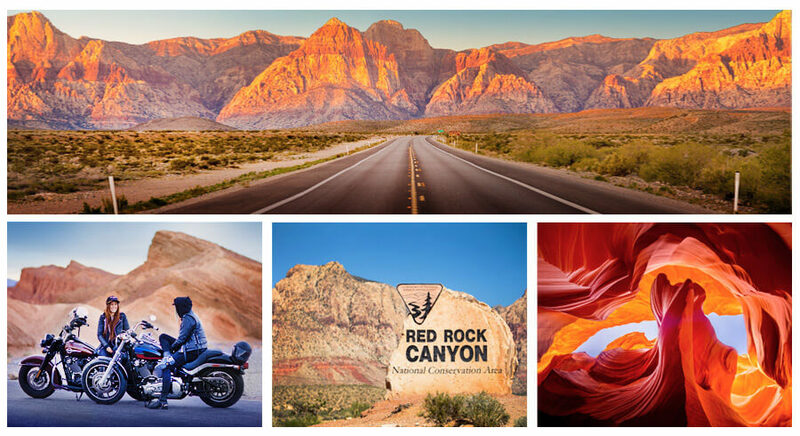 The 195,819-acre Red Rock Canyon National Conservation Area is an easy 30-minute ride west of Las Vegas via US-95 north and Summerline Parkway West. Rising out of a fairly featureless desert-scape, its towering red sandstone and limestone peaks can reach 7,000 feet. Standing like ancient sentinels guarding lands Native Americans considered sacred, the petroglyphs depicting their lives and beliefs are all that's now left behind. Once inside, Red Rock Canyon feels like a wondrous maze of red, pink and white rock spires, domes, canyons, and boulders. The one-way, 13-mile Scenic Drive offers turnouts for relaxed viewing of the moonscape panoramas. During the monsoon season months of July and August, a visit to Ice Box Canyon may reveal seasonal waterfalls. To the adjacent south, Spring Mountain Ranch State Park features historic buildings and hiking trails. Red Rock Canyon is a great place to take a leisurely ride and enjoy a picnic. Many Las Vegas hotels will prepare a box lunch for guests on the go. Bicycling is also available for those inclined, as are 26 easy-to-follow trails for hikers. If you want to hike the trails, plan for at least two to three hours and make sure you pack enough water and sunscreen because the temperatures get very high and the sun can be intense. Rock-climbing is getting increasingly popular in the area, so you are likely to see climbers attempting to scale some of the rock faces. Scenic Drive is open dawn to dusk. Hours are 6 am to 5 pm November -February; to 7 pm in March; to 8 pm April-September; and until 7 pm through October. See if you can get away and explore Red Rock Canyon on a weekday because it gets somewhat crowded on weekends. The road inside the park is 13 miles (21 kilometers) and it’s only one-way so you get to enjoy the view in front with no incoming traffic. 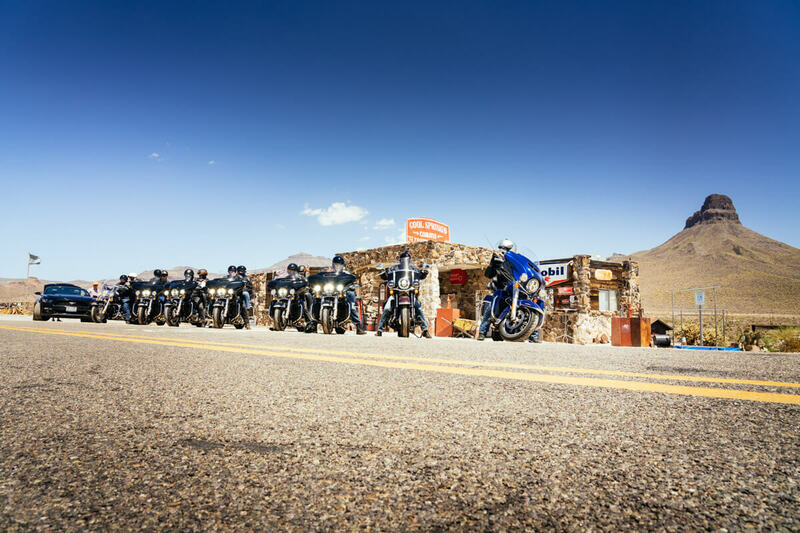 If you want to make a full-day ride, consider including Mount Charleston as your destination before or after the Red Rock Canyon. It’s the snow-capped peak of Mount Charleston that you can see from the Strip in Las Vegas on clear days, and it’s well worth the visit if you’re looking for a quiet getaway in a beautiful mountain area. 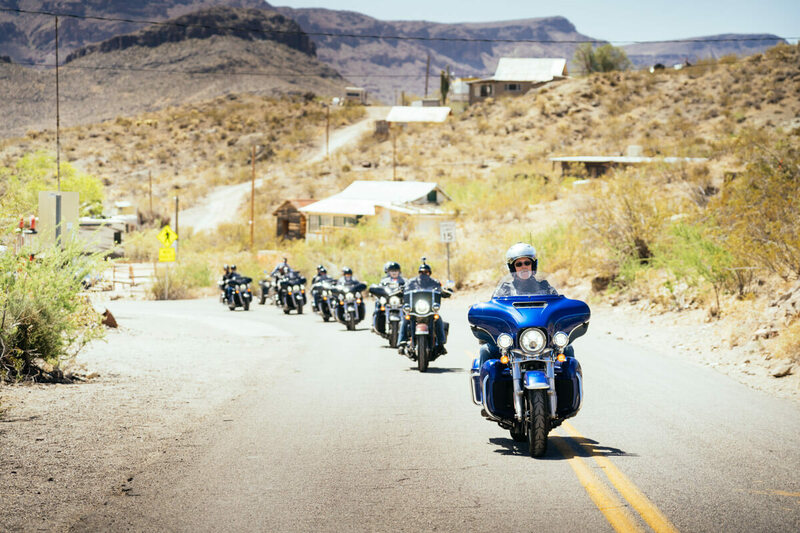 When we ask our riders about the most memorable places they visited, everyone always inevitably mentions Oatman and the twisty mountain ride through the hills towards Cool Springs, AZ. 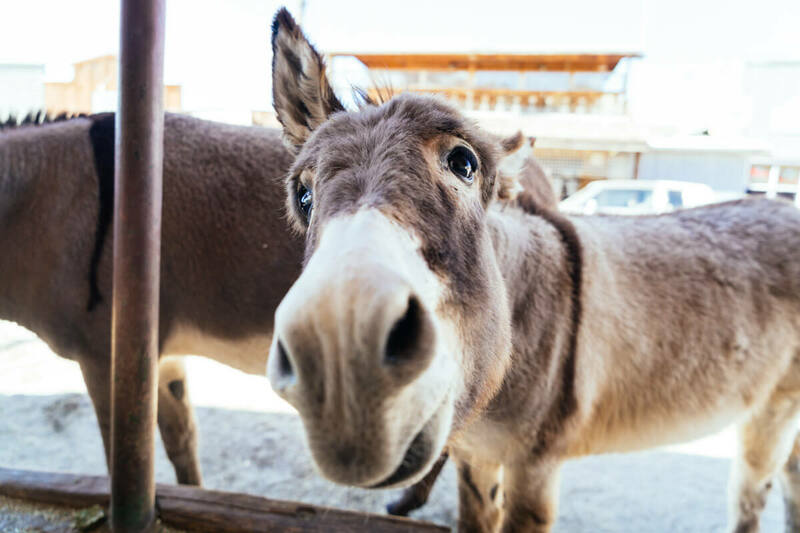 113 miles (181 km) away from Las Vegas and tucked into Arizona’s eerie Black Mountains, Oatman, population of only 128, is a time capsule where people have been replaced with…cute and curious donkeys. 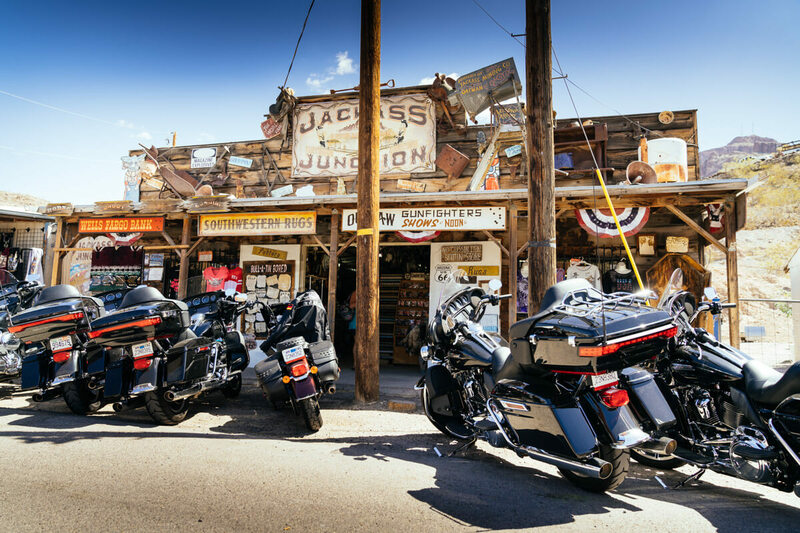 Once a Wild West gold mining town, Oatman has been preserved fairly intact and has become a favorite destination of bikers and tourists alike. 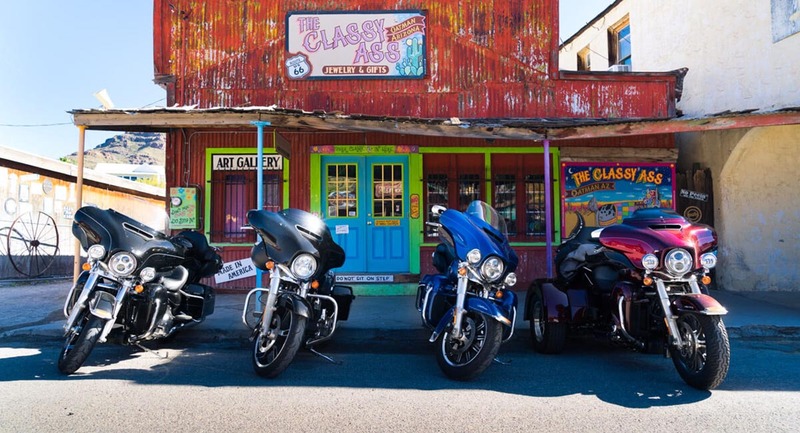 Historic Route 66 is its Main Street, and it still keeps the town alive bringing in tourists, travelers and nostalgic bikers. 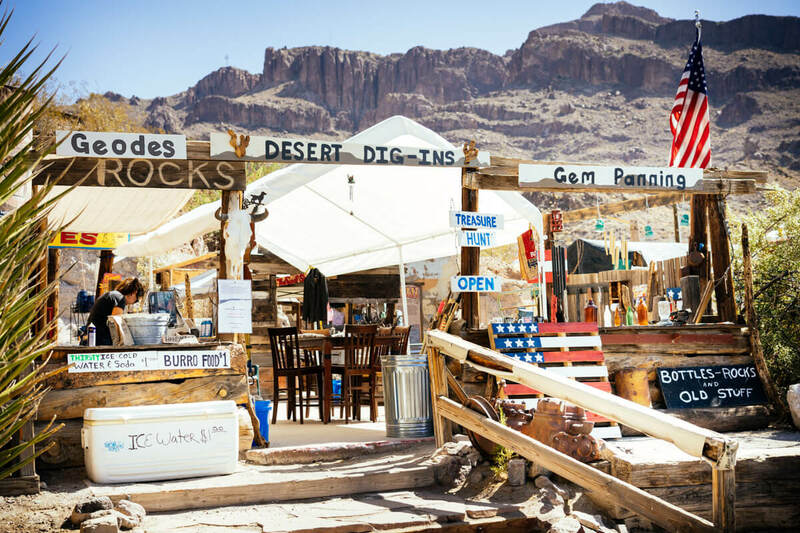 Oatman began as a small mining camp after two prospectors struck a $10 million gold find in 1915, though the area had already been settled for a number of years. Less than a year later, the population of the tiny town of shacks and tents exploded to 3,500. 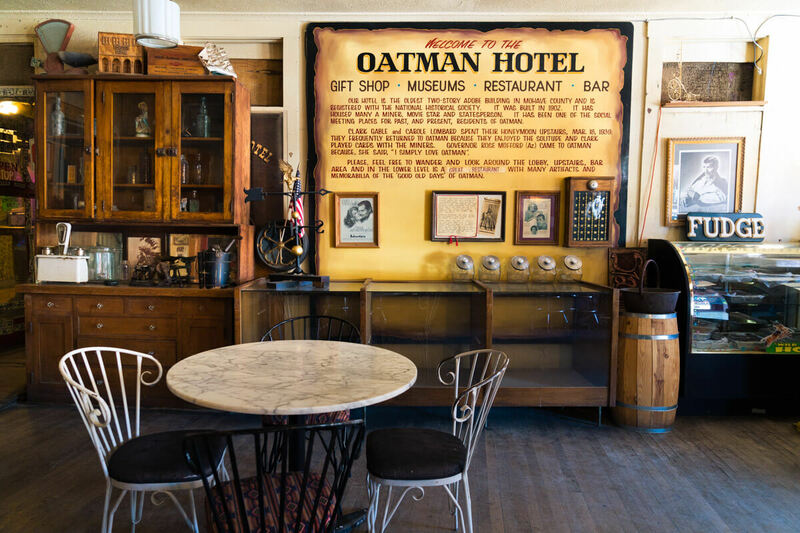 The town was named after Olive Oatman, a young girl kidnapped by the Yavapai, sold to Mojave tribe and later “rescued” in a trade in 1857 near where the town is today, although it’s not clear Oatman wanted to be rescued having been adopted by the tribe and by all accounts treated well. She was known for her blue chin tattoo, considered a rite of passage and worn by many Mohave women of that time. Old West mining towns were usually short-lived. They were hard-luck, hard-liquor places filled with desperate men and women seeking wealth and willing to do almost anything for it. Tales of murder and mayhem are scattered throughout the history books. 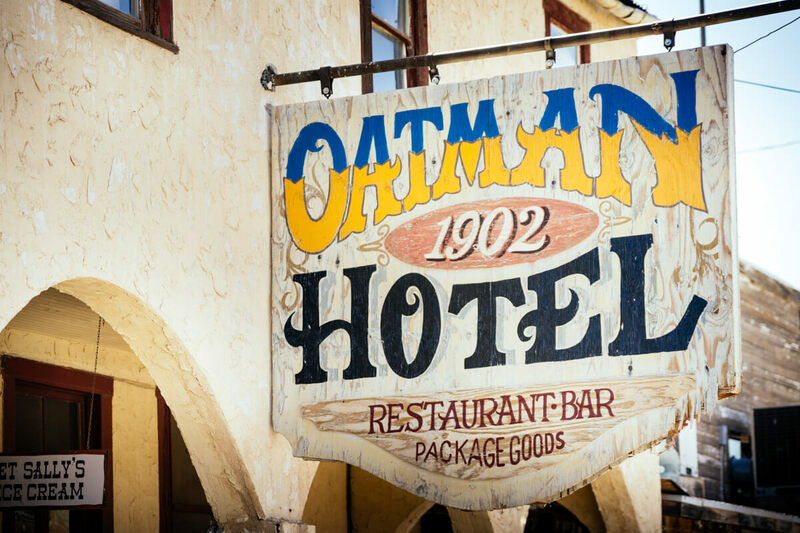 Oatman was no exception. The boom lasted only nine years before United Eastern Mines pulled out, leaving behind some heavy equipment which still remains today, tombstones to broken backs and busted dreams. 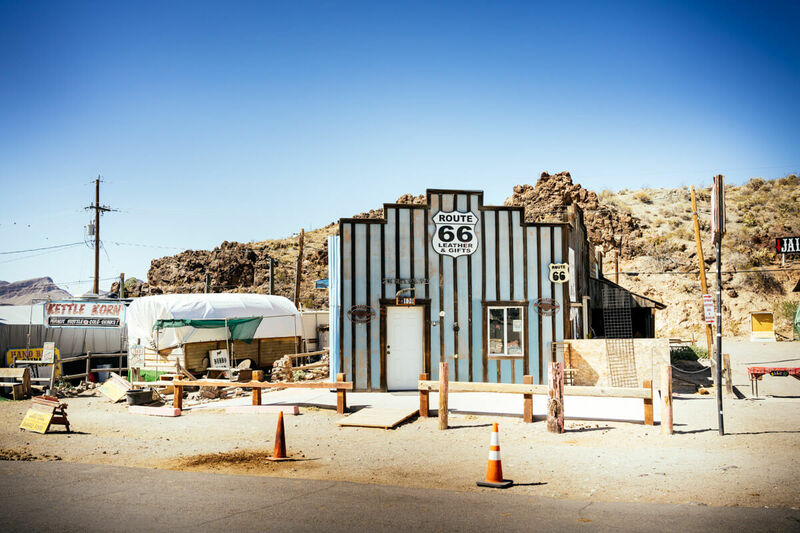 The town survived by serving the endless stream of travelers motoring down Route 66 on their way to California and the end of the line. 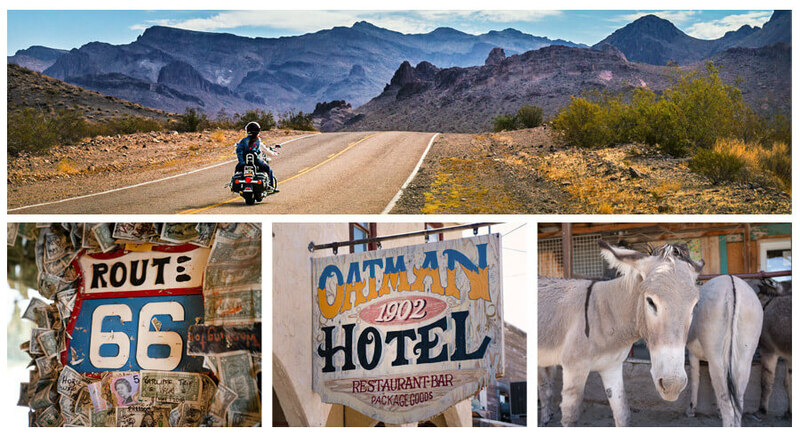 In the early 1960s, America went Interstate crazy and paved I-40, bypassing Oatman. The town nearly died but held on as a kind of living souvenir of a bygone era of Model A’s, flathead motors, and winged tail-fin automobiles. 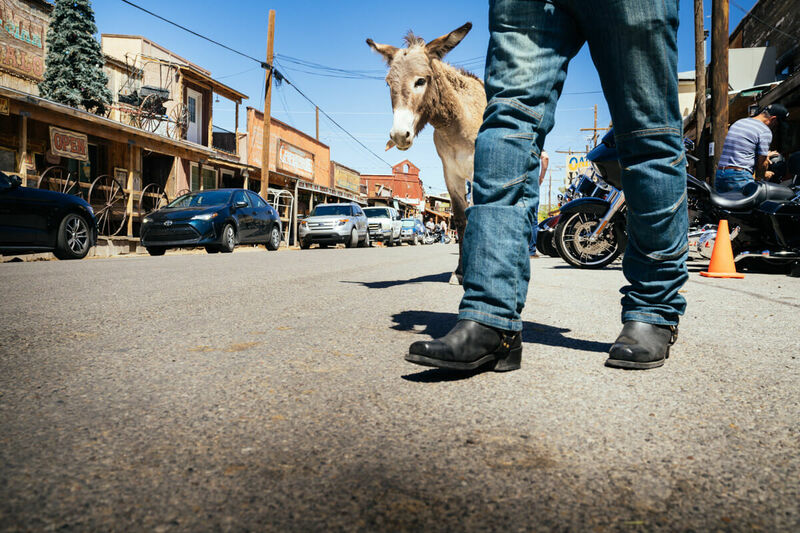 Oatman is now an Old West attraction, offering a couple of restaurants, clapboard buildings, lots of shops and, of course, the donkeys. These wild burros that once served as pack animals now just mosey about town looking for handouts. If you’re not paying attention, they will steal the sandwich right out of your hand, but they will also happily pose for a photo – as long as you’re willing to share your lunch. 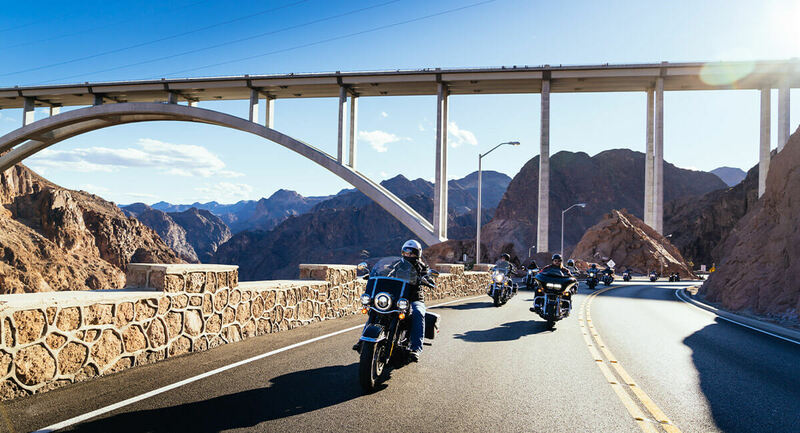 This gem of Western history is a must-ride when the Laughlin River Run, one of the biggest annual motorcycle rallies in North America, which is usually set for late April. The town has no hotels, but accommodations can be found in Laughlin, Bullhead City, Needles, or Kingman. On the way back, make sure to add Hoover Dam as a stop on your way to Las Vegas. Straddling the borders of Nevada and California, the Death Valley National Park is one of the most impressive parks in the country. 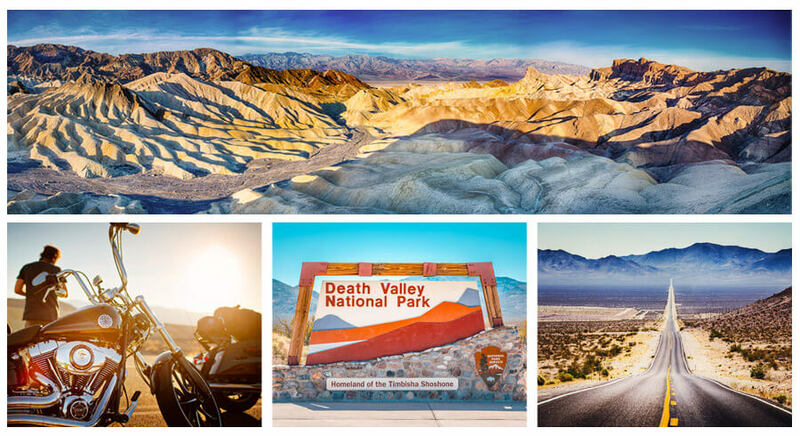 A mere 130 mile (209 km) ride from Las Vegas, Death Valley is a must-see when you’re in the area. The park is an incredibly diverse wilderness of canyons, sand dunes, salt flats, rugged rock formations, and mountains. One of the largest and lowest parks in America, Death Valley has some of the hottest summer temperatures in the world so be aware and pack enough water and sunscreen. Entering Death Valley be sure to ride the scenic Artist’s Drive. It’s a nine-mile (14.4 km) drive that takes you through canyons of the most fantastical colors: pink, blue, red, and yellow. It’s a paved road with a surprising number of curves, and its enjoyed best on a motorcycle. Artist’s Drive is located just off Badwater Road. 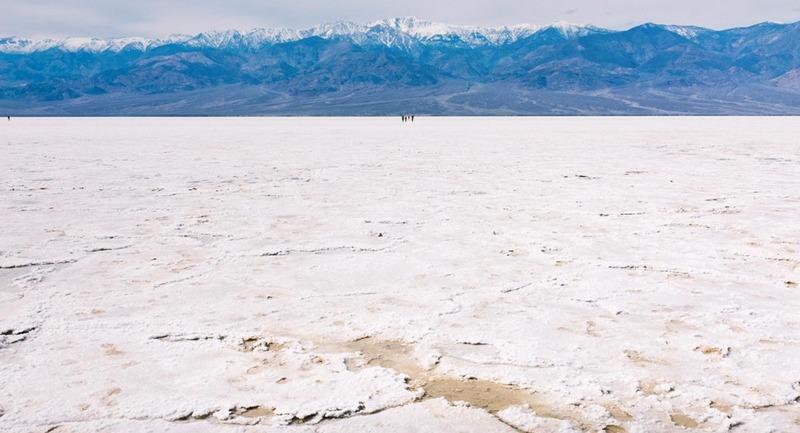 Badwater Basin is the iconic stop in the park and also the lowest point in North America being 282ft (86 m) below the sea level. Walk onto the salt flats and keep walking until the salt formations underneath you begin looking untouched by tourist traffic. There, a good walk away from the parking lot, you’ll find yourself truly immersed by the natural beauty of the land. 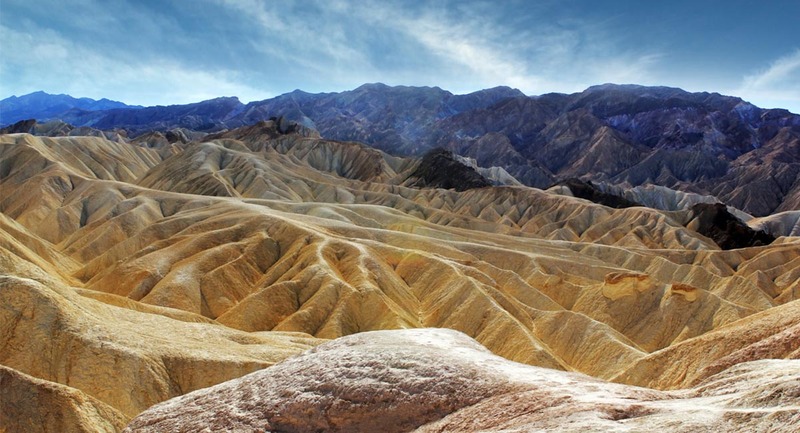 If you plan to spend the night in Death Valley, plan to visit the famous Zabriskie Point at sunrise or sunset. Zabriskie Point offers a breathtaking view of the mountains and is the most spectacular when the sun rises and sets, revealing the otherworldly colors of the rocks. Another viewpoint not to miss is Dante’s View, a terrace revealing the dramatic scenery of the southern Death Valley basin. Here, the salt flats meet the sand and the mountains, making for a stunning view. 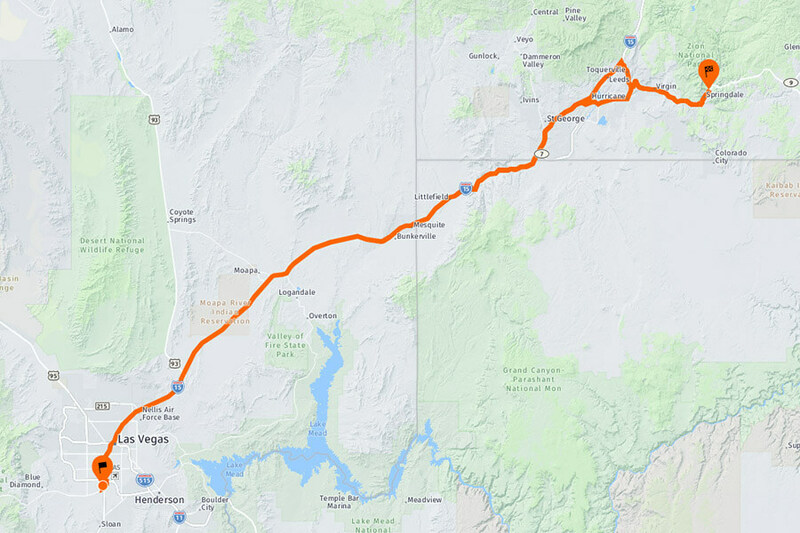 After you visit Death Valley, consider riding through Shoshone and Tecopa back to Las Vegas. You’ll find a nice mix of elevations and curves to add some excitement to mostly straight roads in and around the park. 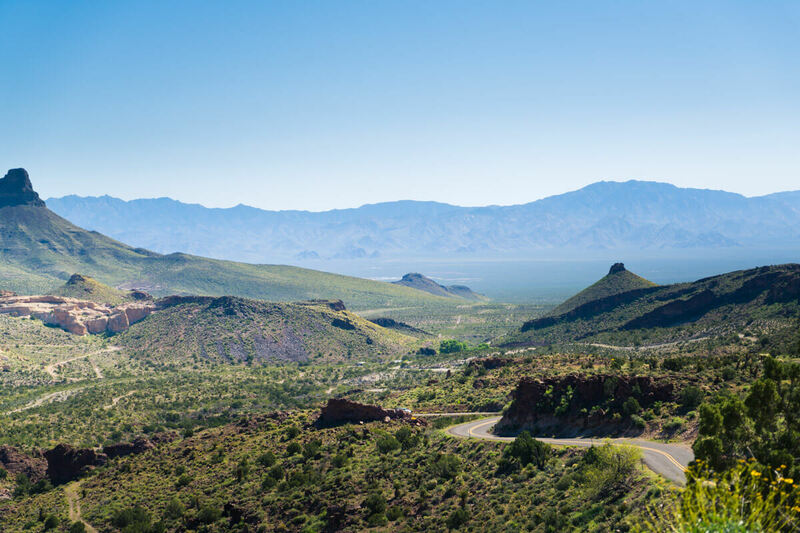 It’s a scenic route offering great views of the Devil’s Golf Course (not a paved road), the Golden Canyon, and the rugged mountains. If you’ve enjoyed the ride in the Valley of Fire, Zion National Park will take it to a whole another level. 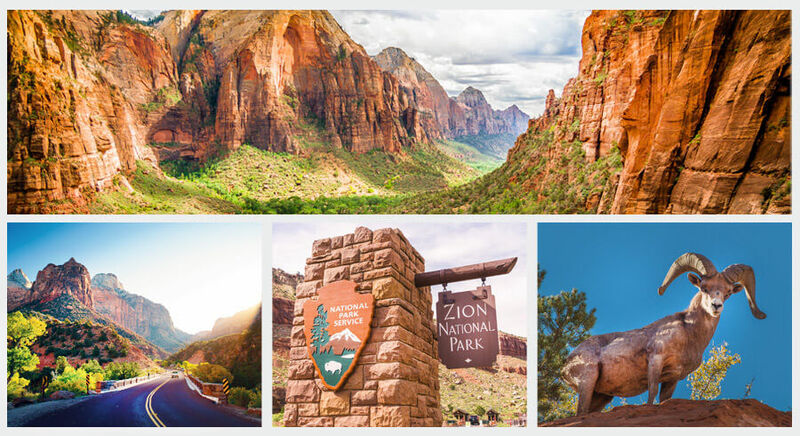 We mentioned Zion NP in our article about riding in National Parks and truly it’s an all-time favorite among thousands of riders who choose to rent and tour with us each year. Zion National Park in Utah is home to Zion Canyon, a spectacular red and tan rock gorge that is over 2,600 feet deep. The park’s beautiful landscape of red rocks, cliffs, buttes, canyons, and natural arches make for an incredible natural wonderland that leaves a long-lasting impression for months and year to come. 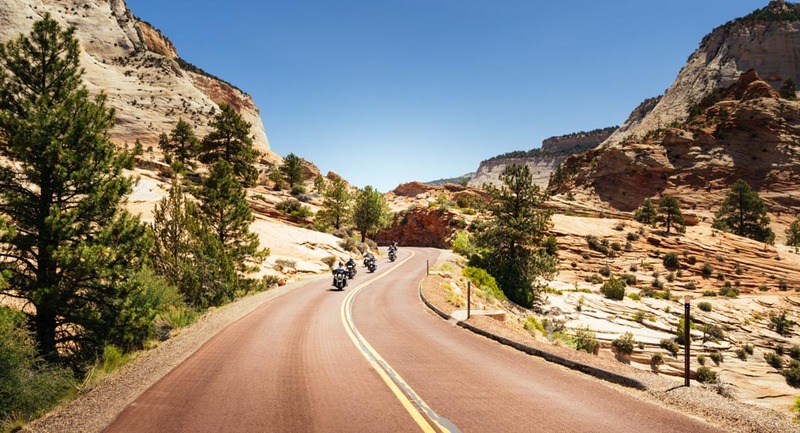 You can ride straight through Zion National Park, exploring its many scenic viewpoints. The ride in the park is about 15 miles (24 km) long and can get packed with the traffic of tourists in RVs and rental cars. Weekdays are ideal for getting more personal time with the park with fewer tourists and a faster pace of riding. The speed limits are quite low and allow for plenty of time to enjoy the beautiful vistas, turns, and narrower stretches of the road. One of the most spectacular views is from the Angels’ Landing, where you can see the full scale and size of the Zion Canyon. Other iconic views are the Court of the Patriarchs, the Kolob Arch, and the Virgin Towers. Zion National Park covers a large area, so if you want to explore every nook and cranny and go hiking, plan to spend several days here. 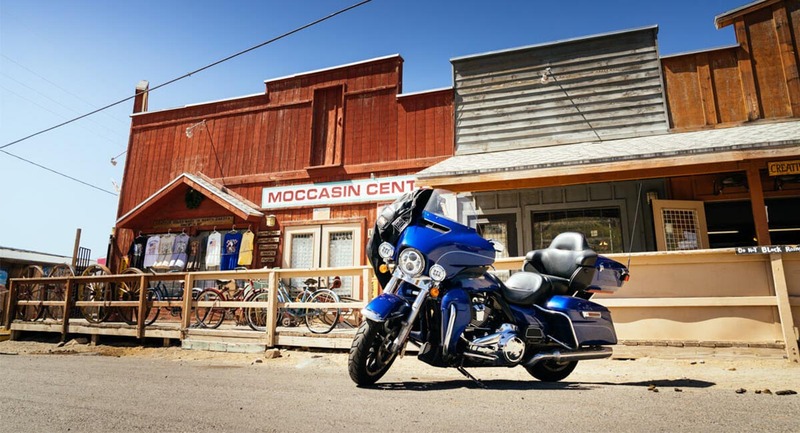 Consider combining the ride in Zion NP with Bryce Canyon, Grand Canyon, a stretch of Route 66, and Oatman all in one extended weekend NP, for an unforgettable time exploring the best of the American West. Here is a possible route for you to follow. 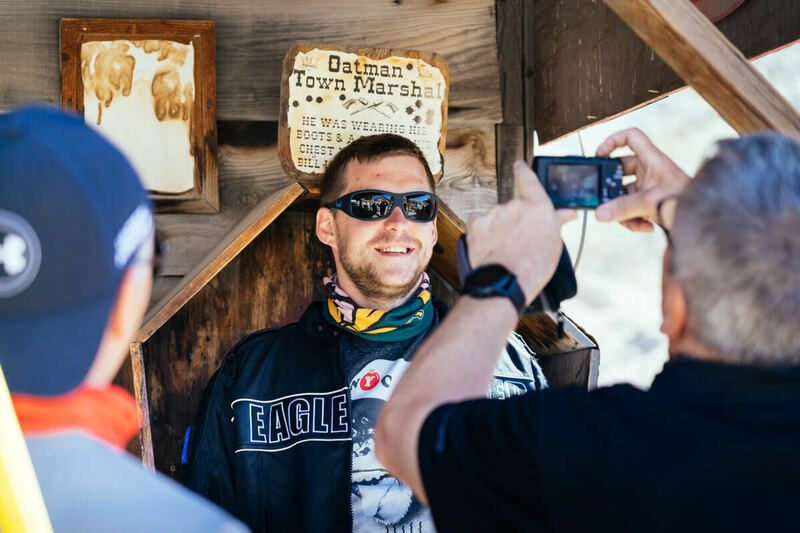 If all these routes get you excited and you have a few more days to spend on the road, our EagleRider guided tours are a fantastic way to take all the hassle away from the planning and simply enjoy the ride with fellow riders from all over the world. 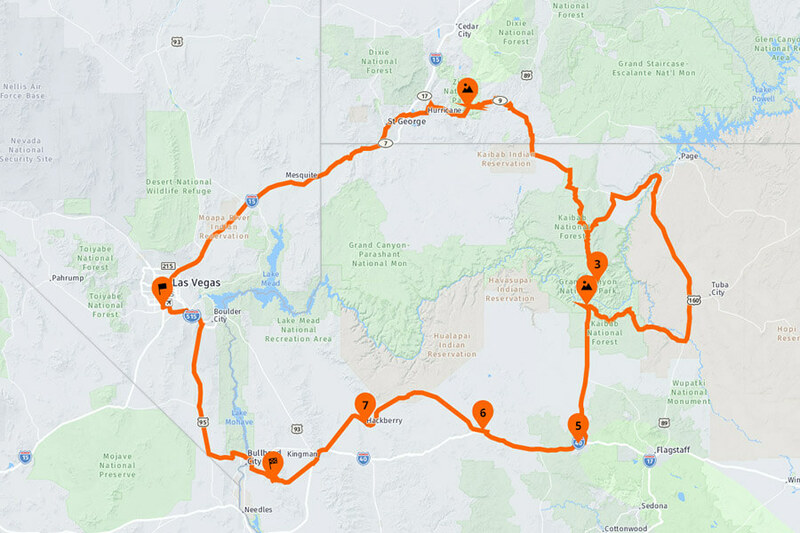 To learn more about our tours and different ways to ride with EagleRider, visit our new Motorcycle Group Travel with EagleRider rentals and explore this fantastic route below. 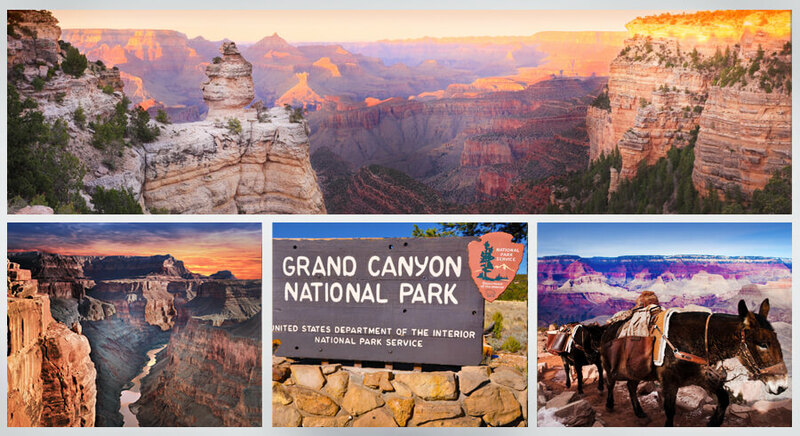 Now that you're fully fired up to explore the best of the American West, let's talk about Grand Canyon for a minute. After all, this is the one place that is on the bucket list of most riders. Riding the Grand Canyon Rim is practically a rite of passage for any motorcyclist visiting the American Southwest. The iconic Grand Canyon, symbolizing the days of the Old West and freedom itself, is one of the world’s largest and deepest canyons created by the mighty Colorado river. 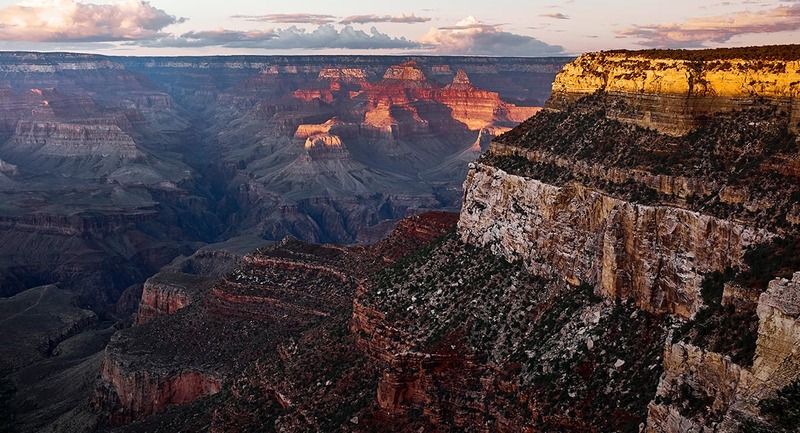 277 miles long (445 km), 18 miles (29) wide and over a mile deep, the Grand Canyon is accessible by many of the designated viewpoints along the way. For the best motorcycle riding, head for the North Rim using Route 67 (double-check for seasonal road closures before going). The South Rim offers better views into the canyon and is the most visited side of the canyon accessible via Route 64. The North Rim has higher elevation and offers a forested approach to the vast chasm. Exploring the Grand Canyon National Park make sure to visit the Sky Walk at Eagle Point. Sky Walk is a horseshoe-shaped glass bridge that allows for an incredible view of the Grand Canyon. You are, quite literally, walking in the sky out and over the canyon itself. On your way back to Las Vegas, stop and admire Hoover Dam on Route 93. This gigantic concrete monster in Black Canyon, built in 1936, creates Lake Mead, which is the largest water reservoir in America. Hoover Dam is 726 feet tall and 660 feet - two football fields – wide, making it one of the most impressive manmade monuments in Nevada and a popular tourist attraction. The best time to visit Las Vegas is spring and fall. Temperatures get extremely hot in the summertime, whereas months from March to May and September to November are sunny but pleasantly mild. If you’re going to Las Vegas in the summertime, make sure to pack plenty of high SPF sunscreen and don’t forget to stay hydrated throughout the day. In winter, temperatures can drop to 35 degrees Fahrenheit, but most of the time the weather is still nice enough for an enjoyable stay. Two big advantages of mid-summer are that the hotel prices drop during the blistering hot summer months and it is easier to get around town. Las Vegas rush hour, like everywhere else, is no fun. Plan your rides around the city and on the freeways accordingly. The worst time to be on the I-15, Martin Luther King Boulevard, and US 95 is 7 am to 9 am and 3 pm to 7 pm. On weekends and most nights, the Las Vegas Boulevard (aka the Strip) is completely packed from the Tropicana Hotel all the way down to the Sahara, and the East Craig Road is busy nearly all of the time. Consider riding early in the morning or after 7 pm to avoid heavy traffic and to thoroughly enjoy the city. When in Las Vegas, be extra careful about pedestrians. Las Vegas attracts millions of tourists annually, so chances are good that sightseers might step into the streets right in front of you. Keep your eyes peeled and keep your fingers on the brake just in case. In Las Vegas, you are allowed to turn right on a red light unless a posted sign says otherwise. Las Vegas is a bike-friendly city. 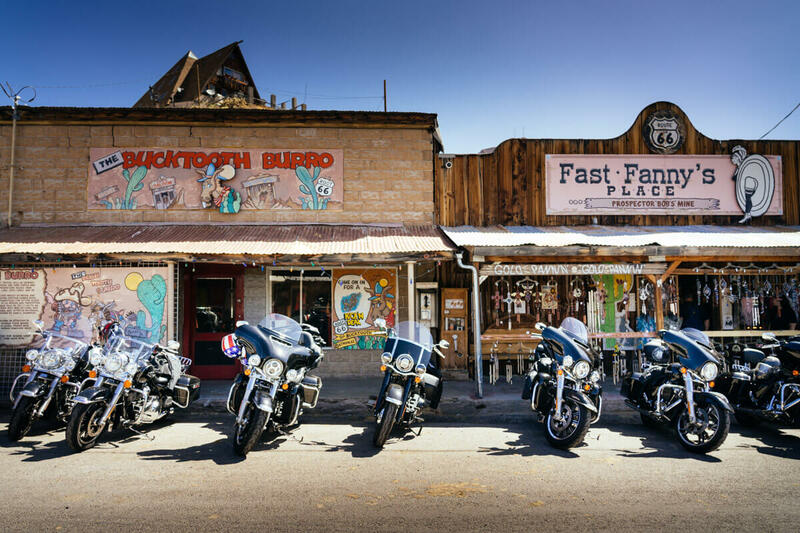 Most hotels will let you park your motorcycle yourself, and many have designated bike parking spots closer to the security cameras for added safety. Some hotels on the Strip, however, do offer valet parking services for bikers. It’s up to you which option you choose, but always make sure your ride is safe and secure in a hotel garage or a guarded parking lot. Parking in Las Vegas isn’t cheap, but there still are areas where you can park for free. Treasure Island, Circus Circus, the Venetian, and the Tropicana all offer free parking even if you aren’t a guest at the hotel. The Welcome to Fabulous Las Vegas sign has a small designated parking lot, and parking is free, so make sure to stop there and snap a photo. There are always large crowds around the sign and no easy access to park a bike right in front of the sign. Staying on the famous Las Vegas Strip and the old downtown are two very different experiences. 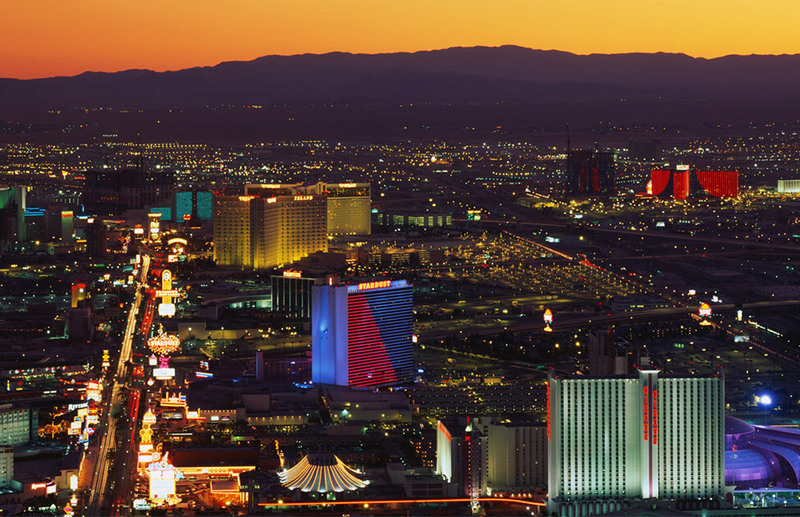 The Strip is full of the glitz and the glamour, flashy shows, luxury hotels and casinos. The Fremont Street area in the old downtown has a more laid back, friendlier vibe, and the hotels in downtown Las Vegas are usually less expensive than those on the Strip. In essence, Old Las Vegas is the quieter, less glamorous version of the Strip. Depending on your budget and entertainment expectations, choose what feels best. You can always hop from one area to the other for the ultimate Las Vegas experience. Las Vegas has earned the nickname "Sin City", but it is also a city of love. It’s known worldwide for its casinos and shows, yet Las Vegas also has a record number of wedding chapels scattered all over town. Eloping to Las Vegas for a quick wedding is a rite of passage for many adventurous couples, so if you find yourself being asked to be a witness of a flash wedding by complete strangers on the street go for it – it’s a unique and all-American experience while you’re in town. Many of our riders get married in Vegas during the tour with fellow riders being the wedding party. This is always a memorable and fun experience for everyone! For sightseeing, some of the most outrageous and wonderful Las Vegas wedding chapels are Wee Kirk O the Heather, Chapel of the Flowers, and Elvis Chapel. There is even a drive-through wedding chapel! There is an unspoken yet duly anticipated custom of tipping in Las Vegas. Similar to most places in America, it is customary to leave a 15-20% tip at a restaurant, and perhaps even higher if the service exceeds expectations. It is also customary to offer a tip to your taxi driver, the bellman at your hotel, and the hotel concierge if they book you an excursion or show. In a casino, make sure to tip your dealer, especially if you’re winning. You can offer them money or chips, it’s entirely up to you. Cocktail waitresses will also expect a tip, as will buffet servers and spa employees. How much you tip is entirely up to you, and never feel the need to tip if you feel the service you receive is bad. 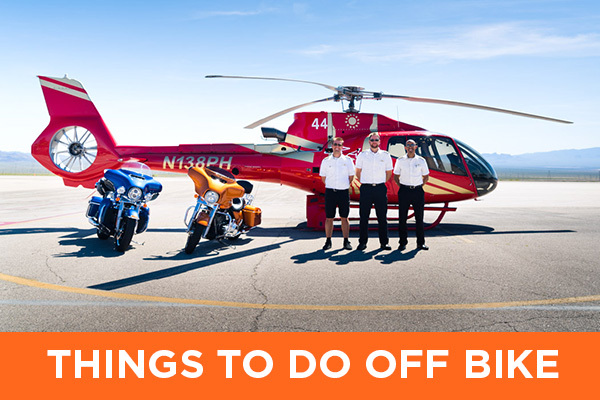 Now that you know how to get around town and where to stay, it’s time to plan your Las Vegas fun and adventures. 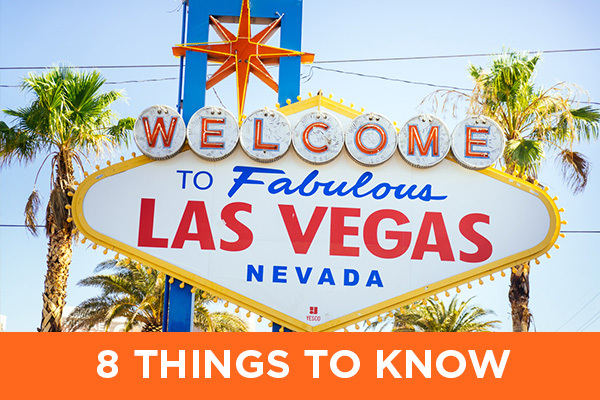 Below, you’ll find a comprehensive guide on the must-see Las Vegas shows, casinos, museums, and experiences. Las Vegas is so much more than just the Strip, the Bellagio Fountains, and the gambling; dive right in and experience all that Las Vegas has to offer. Occupying five blocks of the famous Fremont Street in Las Vegas, the Fremont Street Experience is an open pedestrian mall offering various shows and attractions. Concerts are usually free here, and the area is wildly popular among tourists as it offers the best of Las Vegas: stunning light and firework shows, music, a Viva Vision LED light show, SlotZilla zip line, and shopping. Fremont street is where it all began for Sin City. 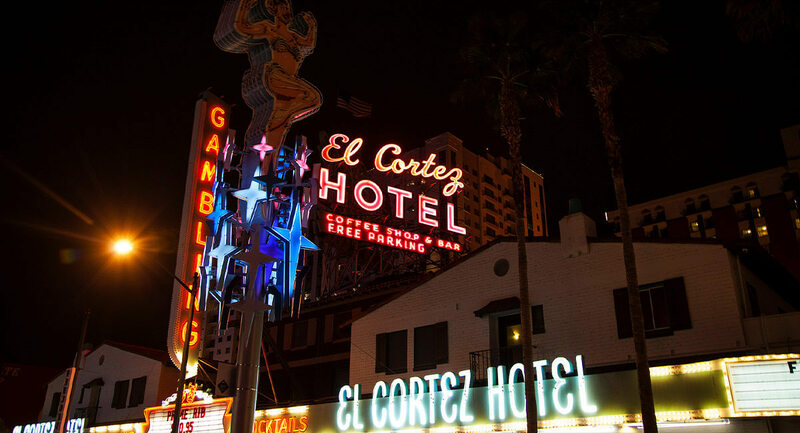 The first hotel in Las Vegas (the Hotel Nevada, now the Golden Gate, was built here), the first high-rise building, the first gaming license, the first telephone – all of it happened right there on Fremont street. The Bellagio Fountains are a must-see in town whether you’re here as a tourist or a seasoned Vegas veteran. A mesmerizing show of water, lights, and music, the Bellagio Fountains are a sight to behold. Every day, more than a thousand fountains (15,000) spring to life in front of the luxurious Bellagio hotel, accompanied by evocative music and lit up in dazzling, colorful lights to enchant you. The show is free, so get there early to find a good spot to experience the fountains and enjoy this iconic Las Vegas experience. Cirque du Soleil, a world-class theatrical performance company, most likely needs no introduction. In Las Vegas, however, plays of Cirque du Soleil are brought to a whole superlative level offering some of the most spectacular and breath-taking shows in the world. If you want to be truly awed, don’t miss Cirque du Soleil play “O” at the Bellagio hotel, where international acrobats, divers, and synchronized swimmers create a water show that seems to exceed human imagination. If you’re looking for timeless entertainment, check out their show “One” at Mandalay Bay exploring the life and art of Michael Jackson. And if you’re into fantasy, mystery, and surrealism, see “KA” at MGM Grand and prepare to be blown away. 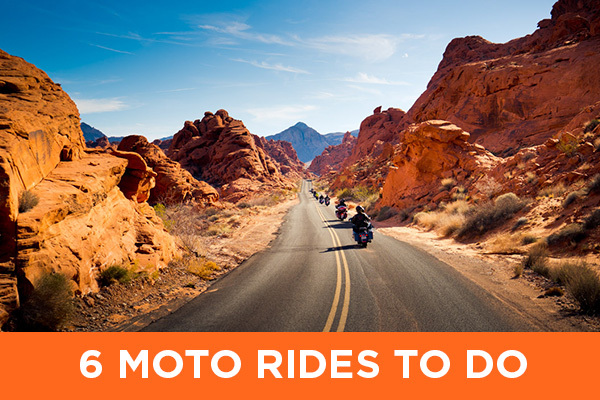 EagleRider Las Vegas will offer you the best ticket pricing through our local partners. Be sure to ask us at the counter about tickets for upcoming Cirque du Soleil shows. 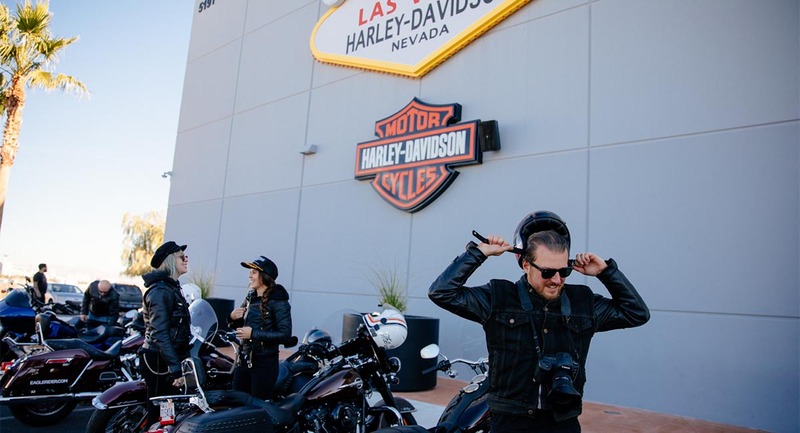 Shopping for Harley-Davidson motorcycles, apparel and accessories on the Strip in Las Vegas feels a little like entering a marvelous motorcycle museum. The first floor of the store is filled with a large fleet of different H-D models, new and used, and it’s more than possible to spend hours just checking out all the bikes. If you need an aftermarket part for your bike, those are available here too. 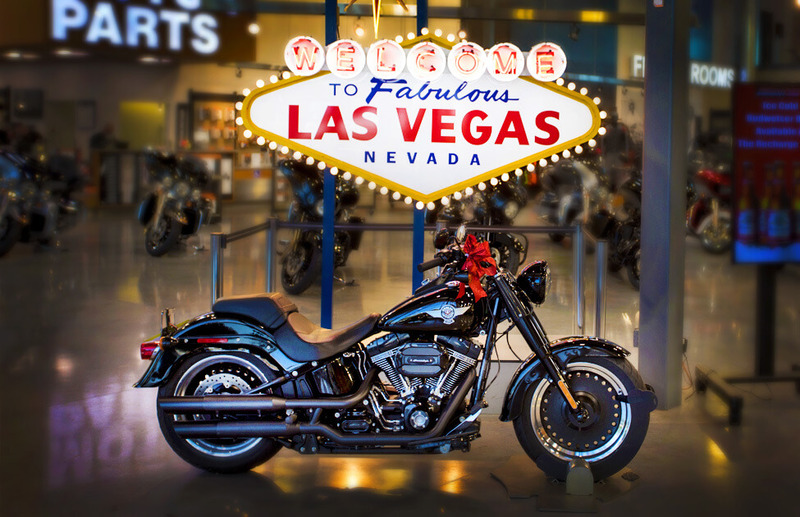 Las Vegas-themed Harley-Davidson apparel and accessories make for perfect souvenirs for you or your riding buddies back home. If you fancy a short trip to Venice without ever leaving the US, the Venetian Hotel in Las Vegas is an easy place to pretend you are in Italy. Complete with classical paintings, sculptures, music, and of course the famous canals, the Venetian offers an authentic Italian experience right here in the city. Visit their exclusive Canal Shoppes - over 160 signature stores lining the canals, snap a few selfies with the stars at Madame Tussaud’s, and for the ultimate experience, go on a gondola ride. 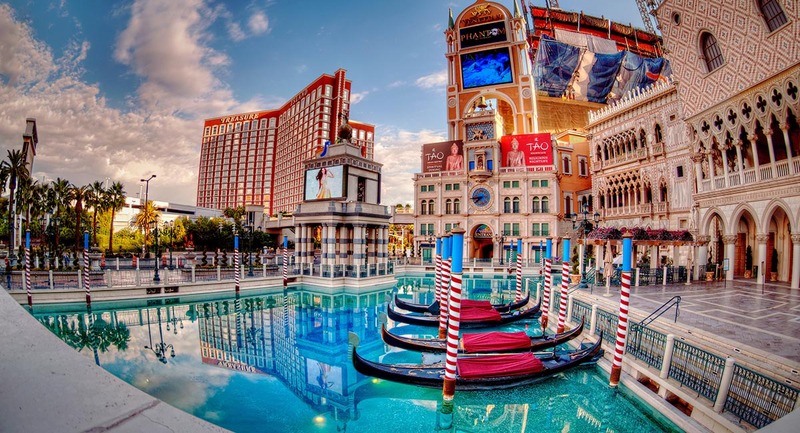 Complete with a serenade-singing gondolier, a canal ride at the Venetian is guaranteed to transport you to the dreamy atmosphere of eighteenth-century Italy. We highly recommend that you ride to the Grand Canyon yourself and soak up the majestic sights from the saddle of your bike. But when in Las Vegas, flying over the Grand Canyon in a helicopter can be a truly once-in-a-lifetime experience. Soaring over the deepest part of the canyon and seeing the sheer scale of this incredible natural monument is a real eye-opener. 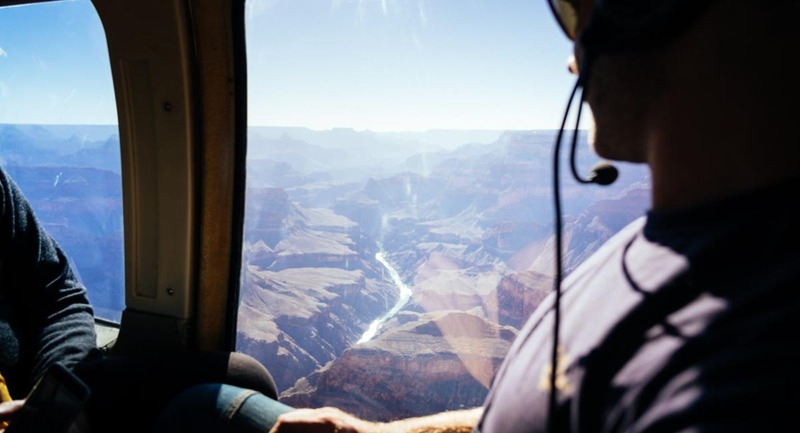 On the helicopter ride, you’ll get a chance to see the magnificent bends of the mighty Colorado River from above, the breathtaking scenery of the Kaibab National Forest, and the red rock formations as you fly through the famous Dragon Corridor. 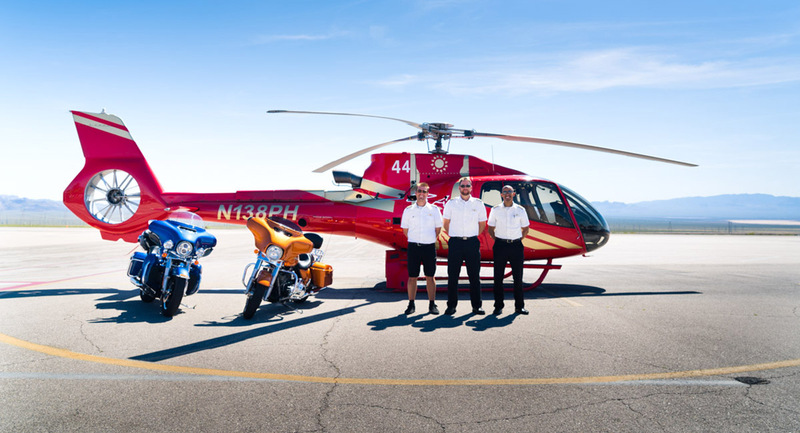 Our partners, Papillon tours, offer some of the most exciting helicopter tours in Las Vegas. Be sure to book your adventure with them, and don’t forget to tell us all about it when you get back. 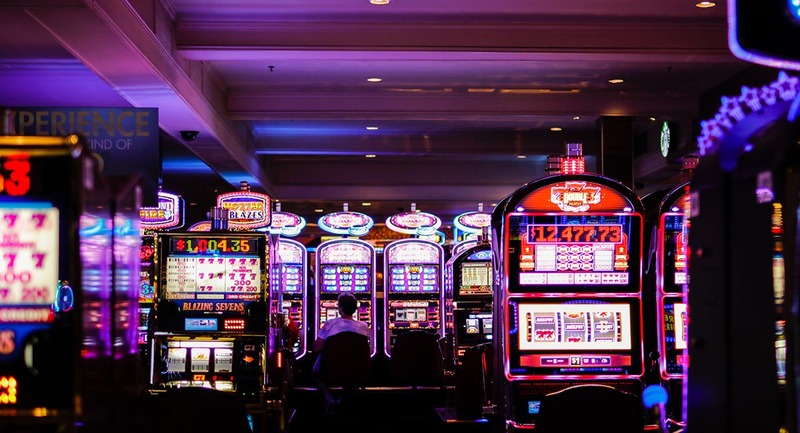 What happens in Las Vegas stays in Las Vegas, so even if you aren’t a passionate gambler, experiencing the Las Vegas casino scene can be a hugely entertaining event. The glitz, glamour, and din of Las Vegas casinos can feel overwhelming, so choose your spots wisely. For slots, visit the Aria Hotel which has the largest slot machine floor in town. For poker and other table games, the Bellagio and Golden Nugget offer the most diversity. If you’re into sports betting, head for Caesar’s Palace, and if you feel like gambling on an artificial beach, Mandalay Bay is your place. If you’re looking for something low key or simply want to try your luck without spending too much money, the minimum bets are usually lower in the Fremont Street area compared to the Strip. To play blackjack, the minimum bet at Caesar's Palace is $10 but only $5 at the Golden Nugget. In Las Vegas, there is nothing more iconic than the city’s many neon signs. 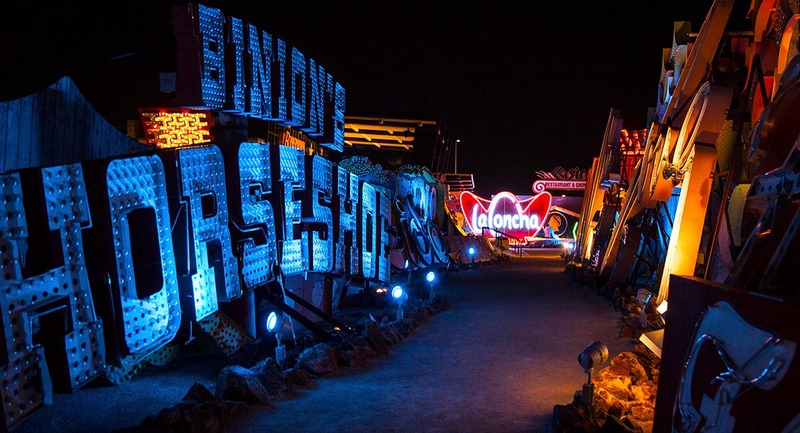 If you’d like to know more about the history and design behind those magical lights, visit the Neon Museum on North Las Vegas Boulevard. Founded in 1996, the museum has a spectacular collection of neon signs assembled into intriguing exhibitions. The Neon Boneyard is the museum’s famous outdoor exhibition featuring some of the most interesting rescued Las Vegas neon signs. Unrestored and retaining their original look and authenticity, wedding chapel signs, as well as many hotel and casino signs, make up the Boneyard and the Boneyard North Gallery. Located in the historic La Concha Motel lobby, the museum often hosts various exhibitions and displays fifteen fully restored and functional neon signs among many others that are illuminated by ground light. The museum is open 9 am and 4 pm on most days and there are night shows for special installations. Occupying the former Las Vegas post office and courthouse built in 1933, the Mob Museum is a fascinating glimpse into the way mobsters shaped American history. 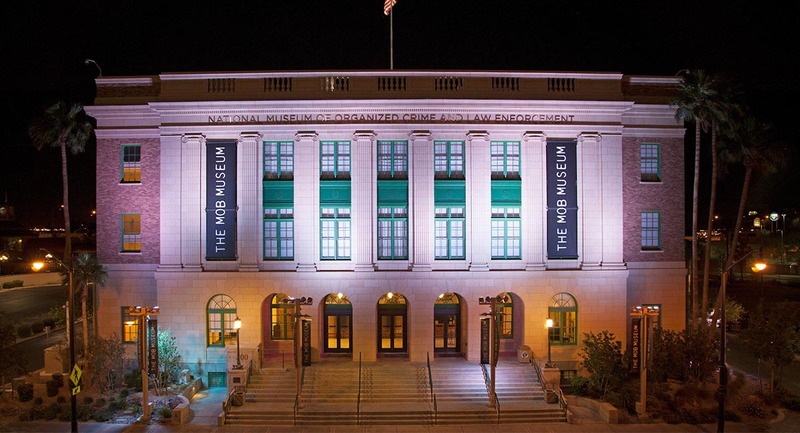 If you’re curious about some of the most daring casino scams, bootlegging history, mob violence, and various strategies and techniques used by law enforcement, the Mob Museum is a great place to explore the dark side of America. Collections vary from the Prohibition-era exhibits to modern-day criminal history, complete with the Crime Lab show and the Firearm Training Simulator where you can experience what it’s like to try and catch the bad guys yourself. The Nevada Test Site, an area where the nuclear testing was carried out in the 1950s, is right on the doorstep of Las Vegas. The National Atomic Testing Museum is not your typical Las Vegas spot, but history buff or not, a visit here is a great way to get away from the hustle and bustle of the city and experience something different. The museum offers the “Ground Zero Theater” experience where you can “observe” an atomic event, as well as numerous photographs, artifacts and memorabilia from the era. Plan to spend at least a couple of hours exploring the museum and don’t forget to buy your Area 51 souvenir from the gift shop. 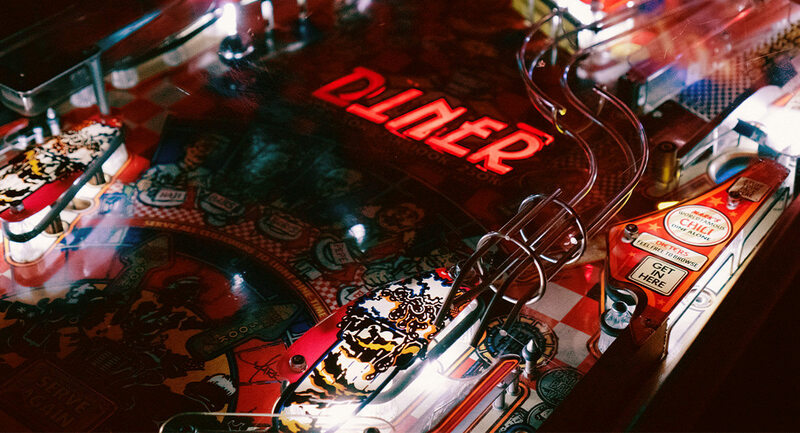 Las Vegas is known for all things strange, outrageous, fascinating and just plain weird, and this is exactly what the Pinball Hall of Fame is about. This museum contains the world’s largest pinball collection offering over 200 arcade games from the 1950s throughout the 1990s. All of the machines are fully restored and functional, so you can have a go at your old favorites like the Impacto or Black Gold. At the Pinball Hall of Fame, you can have all of the fun and none of the risk that you get at the gaming tables. Seeing a Knights hockey game is easily the thing to do in Las Vegas right now. The team was built on players who had been discarded from the other teams in the league. They went to the Stanley Cup Finals in its very first year of existence in 2018, something which had never been done by an expansion team before. The Knights instantly became the pride and joy of Las Vegas. You don’t need to check the Internet to know when the games are on: the New York New York hotel Statue of Liberty on the corner of Tropicana and Las Vegas Boulevard on the Strip is dressed in a Golden Knights jersey throughout the playoffs. If you’re looking for a different kind of thrill in Las Vegas, try a ride in the Stratosphere Insanity Tower. Insanity is a giant mechanical arm that extends over the edge of the Stratosphere Tower at 900 feet offering mind-blowing views of the city and an insane high-speed ride. Your body is being tilted downward and spun around at dizzying velocity while you watch the lights of the Strip blur into one phantasmagorical mirage below you – that is if you dare to open your eyes during the ride. There is another kind of experience on top of the Stratosphere Tower: The Big Shot! This type of “exhilarating fun” may not be fun for everyone, but if you’re a fan of roller-caster thrills, it is definitely worth exploring. Las Vegas itself can often feel like a parallel universe, and if you want to truly experience something mind-bending check out the city’s cutting-edge Virtual Reality labs. One of the most immersive and popular VR places in Las Vegas is the VOID where you can explore different worlds and go on crazy Indiana Jones-like adventures. Another great VR spot is VR Adventures, a virtual reality lab that offers experiences like Soaring Hero, Jungle River Raft, Freefall Zipline, and Haunted House for those seeking a bit of a scare. The art world in Las Vegas is as vibrant as anywhere else in the country, but only here it becomes a part of life. The peculiar and wonderful Seven Magic Mountains located just ten miles south of Las Vegas is an exhibition of seven towers built from brightly colored boulders stacked on top of each other. 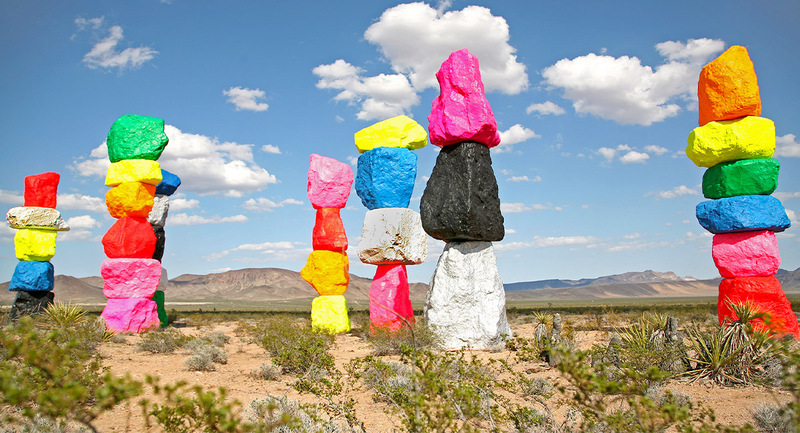 Situated against the stunning backdrop of the Mojave Desert, the Seven Magic Mountains, created by Swiss artist Ugo Rondinone, is a perfect example of how humans can transform seemingly inhabitable places into oases of life and creativity. Las Vegas has unexpectedly become a very chef-oriented city in the last few years. Any celebrity chef you can think of has one if not three restaurants right here in town. Gordon Ramsey, Bobby Flay, Guy Fieri, Thomas Keller – these are just some of the Las Vegas regulars. 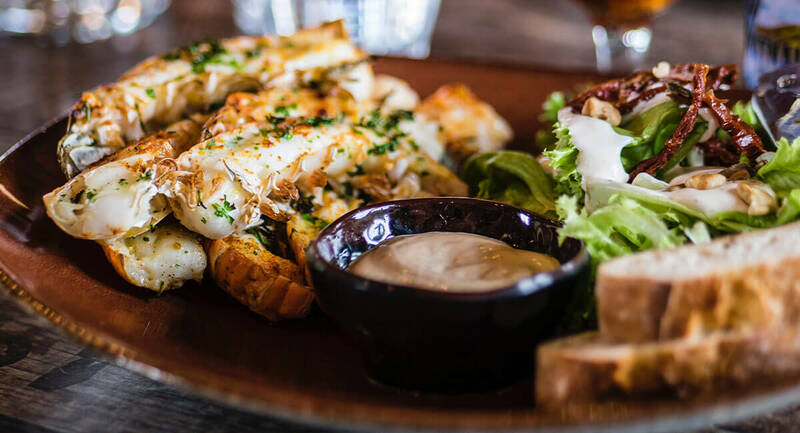 There are several Michelin-star-level locations that can present a once-in-a-lifetime meal, not to mention the countless buffets around town that offer an infinitely varied selection of foods from all over the world at one combined price. Las Vegas has now truly become a foodie haven. If you’re feeling extravagant, Scotch 80 Prime in The Palms, for example, offers the most expensive fish there is the Dover Sole, which they fly in from overseas daily. There is a lot more to Las Vegas than its fame and reputation might reveal. From quirky art and eccentric and wonderful museums to glamorous attractions and mind-blowing shows, Las Vegas is a diverse city that has much to offer. 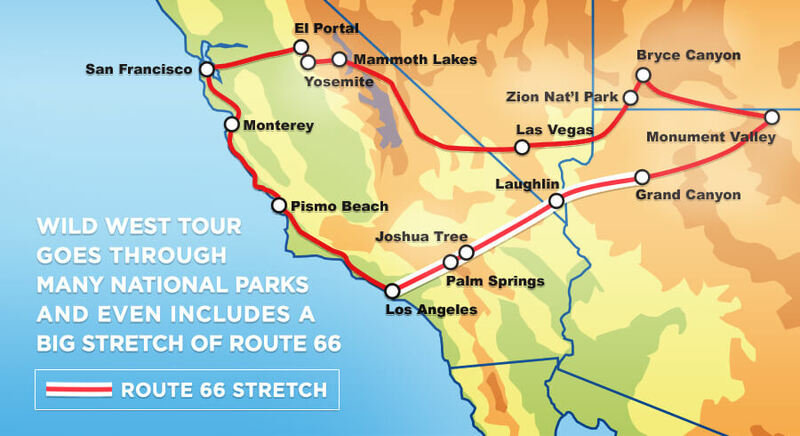 And if you long to get away from it all, the Las Vegas area has some of the most stunning National Parks, day rides, and scenic roads, all located within short distance of the city making it a perfect base for your next adventure. 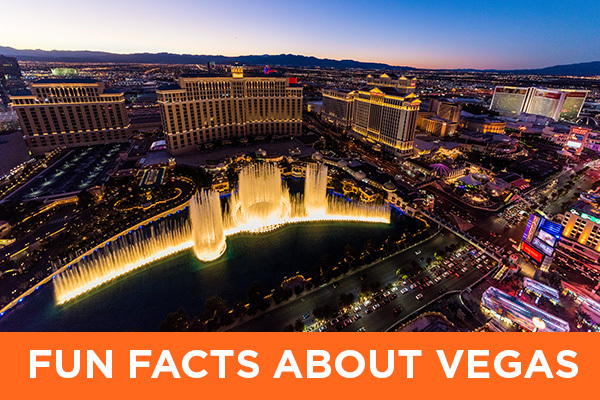 If you’re still undecided about visiting Las Vegas, here are some fun facts to help you make up your mind. Hoover Dam:It took more than ten thousand people to build the dam in four years. The concrete used in the construction would be enough to build a two-lane highway from San Francisco to New York. Welcome to Fabulous Las Vegas Sign:Tourists used to risk their lives trying to get a photo of themselves with the sign: because there was no parking available, people would stand in the middle of the road to snap that precious picture. If you love this iconic sign as much as those brave souls did, you can now buy a piece of it. When the light bulbs of the sign are replaced, they are sold online. Neon in Las Vegas:One of the most recognized neon signs in the city is Vegas Vic, a giant neon sign of a cowboy located in Fremont Street. Las Vegas loves its neon so much there is even a Neon Museum in town, dedicated to the history and culture of those glitzy symbols of Las Vegas. Elvis and Las Vegas:Elvis Presley, king of rock and roll and one of the most iconic American singers of all time, had a special relationship with Las Vegas. Here, he performed 837 consecutive shows which were completely sold out. The Luxor Light Beam:The Luxor Light Beam in the Luxor Hotel is the most powerful light in the world. Visible from a hundred miles away, the Luxor Light Beam costs $15,300 a month for electricity. Las Vegas Underground Tunnels:Las Vegas has a large maze of underground tunnels below the city. Used as flood channels, these tunnels are inhabited by the city’s homeless – a warning to those who gamble just a little too much. Lucky Las Vegas Math:It’s not always about luck: in Vegas, the slot machines are set at a certain payout rate. Legally, the machines have to have at least a 75% payout, meaning that if you put in $100, you should get your $75 back. Do your math and see if you can create your own good luck. Las Vegas Hotels:Las Vegas is home to fifteen of the world’s top 25 hotels – a serious record for a city that never sleeps. Las Vegas Winnings:The largest sum ever won on the Las Vegas slots was at the Excalibur. After putting in $100, a 25-year-old software engineer won $39 million, beating the odds at the time for 1 in 16.7 million. Name Origins:Las Vegas translates to “the meadows” in Spanish. 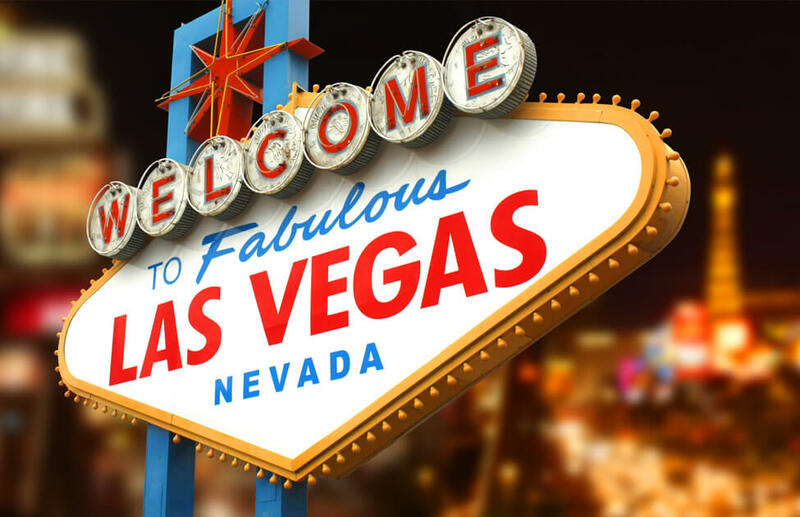 The city was named Las Vegas by a traveling trader Rafael Rivera in 1821. Rivera stopped here for some water and, after observing the area, named it “the meadows”. The city was founded by ranchers and railroad workers but quickly found that its greatest asset was not its springs but its casinos. McCarran International Airport:McCarran in Las Vegas is the seventh busiest airport in the United States and North America. The Strip at Night:Las Vegas Strip at night is the brightest light on Earth seen from the outer space due to the concentration of lights of its many hotels and casinos. 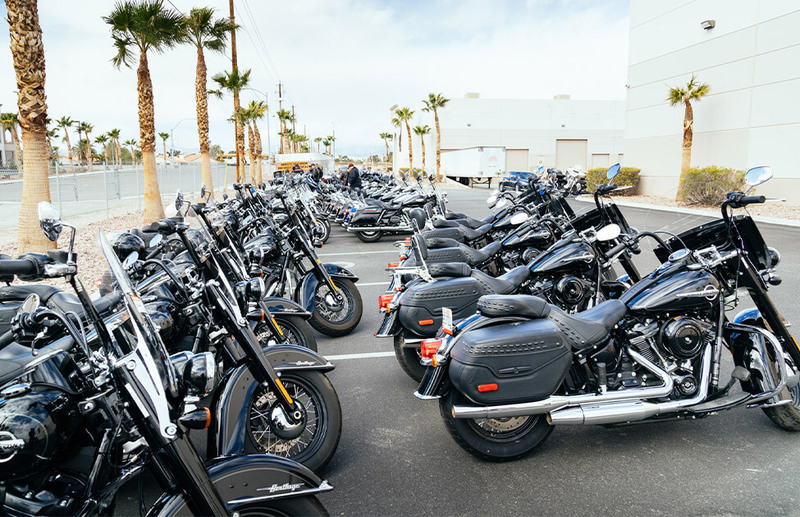 Every year we welcome thousands of riders to our 4 EagleRider locations in Las Vegas. 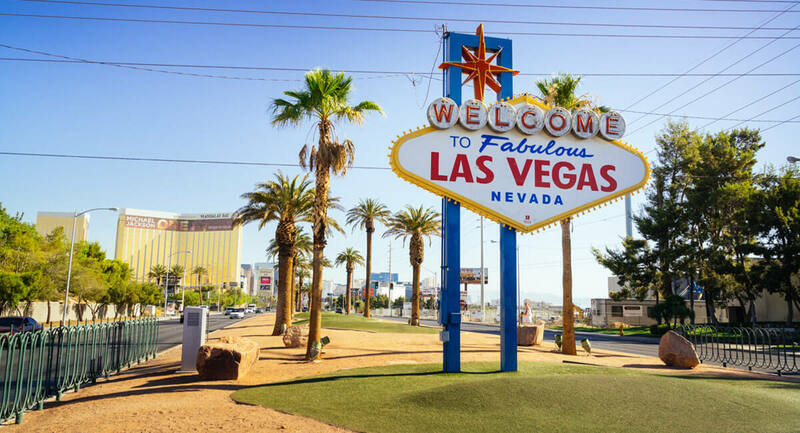 If you’re in town for a day, a weekend, or a longer trip, this is a great starting point for your adventure and we hope you found this article helpful as you prepare for your visit to Fabulous Las Vegas.